Carol Bere recently published "Getting Out of the Flames" - her review of the Letters of Ted Hughes - in Contemporary Poetry Review. Enjoy! ‘"The Influence of Somebody Upon Something": To the Lighthouse in Sylvia Plath's Work'. Woolf Editing, Editing Woolf: Selected Papers from the Eighteenth International Conference on Virginia Woolf, ed. Eleanor McNees and Sara Veglahn. (Clemson, SC: Clemson University Press, 2009). ‘"What Girl Ever Flourished in Such Company? ": Sylvia Plath's Religion'. Yearbook of English Studies: Religion and Literature, ed. Andrew Tate. (London: Modern Humanities Research Association, 2009). Below is an updated list of titles expected to be published this year, as could be found through various sources. Plath Profiles is still accepting submissions for Volume 2. If you have an essay, book review, or work inspired by Plath, consider Plath Profiles. Click here for submission guidelines and deadlines. Essays, book reviews, and poems inspired by Plath from Volume 1 have been downloaded thousands of times. Read them here. Due to delays beyond their control, Plath Profiles have had to delay publication of essays by Karen V. Kukil, Aubrey Menard, and Barbara Mossberg. Look for them in Volume 2! Sylvia Plath continues to be the focus of writers publishing in other journals. Annika Hagström recently published her essay "'Stasis in Darkness': Sylvia Plath as a Fictive Character" in English Studies 90:1 , 2009: 34-56. Annika spoke at the Sylvia Plath 75th Year Symposium on this very subject; it is wonderful to see it in print. Kylie Hibbert recently published "Mirror Talk" in issue 15 of Rattapallax. "Mirror Talk" is a video inspired by Plath's poem "Mirror". The Location Register of English Literary Manuscripts and Letters at the University of Reading (U.K.) indicates that the University of Edinburgh owns typescripts and/or photocopies of the following poems by Sylvia Plath: "Daddy", "Morning Song", and "Lady Lazarus". These Plath materials are held in the Norman MacCaig papers (MS.3208.10-11). All three poems are typescripts, possibly carbons. They are typed, but it is unclear by whom. Both "Daddy" and "Lady Lazarus" merge two stanzas together, and someone in an unidentified hand wrote "space" in the margins. Here and there words are crossed out. These typecripts do not necessarily match typescripts of the those poems held at the Mortimer Rare Book Room at Smith College. The typescript of "Morning Song" is unmarked. Handwritten on each typescript is "Sylvia Plath" in the top right corner. The handwriting is the same as handwriting on "Daddy" and "Lady Lazarus". It is possible that the handwriting is MacCaig's. "Daddy" and "Lady Lazarus" appeared in print together several times through 1963 in various periodicals such as The New Yorker, The Review, and Encounter. In 1966 they were printed in an issue TriQuarterly which focused on Plath. The University of Edinburgh also has poems by Plath that are unbound and possibly galley proofs. These poems include: "Daddy", "Morning Song", "Lady Lazarus", "Poppies in October", "The Moon and the Yew Tree", and "You're". I would like to thank Edward Mendelson of Columbia University for directing me towards the Location Register of English Literary Manuscripts and Letters at the University of Reading (U.K.), which enabled me to locate these item. Bloom really does not care much for Plath. In the four or five publications which he has edited and/or written an introduction, I am left each time thinking the following: 1) Why did I buy this book? and 2) Why does Bloom even bother to include Plath in any series he edits? Fortunately this title was sent to me buy the publisher to review. Unfortunately I cannot recommend it. "Though I recall being unable to get very far with it [in 1971], one learns to be more dispassionate as old age augments..."
"It seems to me not possible to discover any aesthetic merit in The Bell Jar." "It is always a little painful, for me, to place a worthy but inadequate book in an authentically critical perspective." "Admirers of The Bell Jar have compared it to Charlotte Bronte's Jane Eyre, a juxtaposition that obliterates Plath's book." If one had not read The Bell Jar, why would they now? And what sort of introduction is this? It should at least resemble or hint upon the later content, no? Most of the book is heinously written - and aside from the introduction - cannot have been touched by Bloom. I have little respect for him, but I gather from what I do know that he is likely a better writer than this. There are dozens of mistakes throughout the first 58 pages of the book, which appears to be the only original writing. I don't normally write in books, but I had to write "No" many times when the writer simply got things wrong. The biographical sketch is atrocious. One of my favorites is, "She and Hughes moved to the United States, where Plath taught at Smith College for a while..." For a while! How nonchalant. And the anonymous writer also claims that Plath ingested sleeping pills before committing suicide on February 11, 1963. This was news to me. The biographical sketch may have been written in 1989 as it concludes, "Sylvia Plath's gravestone is in Yorkshire, England, with Ted Hughes's name chipped off, the vandalism most likely carried out by one or several of her enduring fans." I feel like I can be critical of "short" biographies such as this. At two and a half pages I ask, "Why bother?" Following this is a section called "The Story Behind the Story", a "List of Characters", and "Summary and Analysis." "The Story Behind the Story" is expanded and redundant in "Summary and Analysis". Throughout the "Story" and "Summary", the writer states that Buddy Willard attended Yale Medical School. Buddy Willard did not attend medical school at Yale. Esther Greenwood says, "Buddy kissed me again in front of the house steps, and the next fall, when his scholarship to medical school came through, I went there to see him instead of to Yale" (Chapter 5). "Instead of to Yale" implies not at Yale. The essays that follow page 58 are all complete or nearly complete reprints from other sources. It would be worth the effort to track these down as they originally appeared as in this book they are tainted. Each essay is headlined not by the title of the piece, but by a subjective summary or theme. This I found to be quite confusing and distracting. The book closes with a poorly edited and annotated bibliography, a list of works by Plath (hardly complete), and finally the sources for the essays. I really wish I had something nice to say, but I just don't. Like Bloom's first attempt to read The Bell Jar in 1971, I didn't finish this book. It's Valentine's Day, but I'm just not feeling the love. The book will sit on my bookshelf and collect the stuff of Buddy's cadaver's and Esther's poems: dust. Today is the 46th anniversary of Sylvia Plath's death. While Plath was known in some poetry and literary circles at the time of her death, there were only a few obituaries printed in February 1963. Throughout 1963, however, as her poetry and prose appeared in print, small obituary notices appeared alongside the work. The following is a list of some of the obituaries and tributes to Plath in the months after her death. If you know of any not listed here, please let me know! Alvarez, A. "A Poet's Epitaph." The Observer. February 17, 1963: 23. Alvarez, A. "Sylvia Plath." The Review 9. October 1963: 20-26. "Contributors." Poetry 102. August 1963: 347. Hamilton, Ian. “Poetry.” London Magazine New Series 3. July 1963: 54-56. Hughes, Ted. "Note preceeding ten poems." Encounter 21. October 1963: 45. Note. The Listener. August 29, 1963: 312. Smith Alumnae Quarterly. April 1963: 209. Starbuck, G. "Spectator Notebook." The Spectator 210. February 22, 1963: 220. "Sylvia Plath Hughes." The Townsman. February 21, 1963: 4. "Tragic Death of Young Authoress." Saint Pancras Chronicle. February 22, 1963: 5. Also in 1963, Critical Quarterly (Spring and Summer), Atlantic Monthly (April), Punch (April 3), The New Statesman (May 3), London Magazine (April and June), Poetry (August), The New Yorker (August 3), The Listener (August 29), and The Observer (February 17, October 6 and November 3), The Review (October), and Encounter (October) printed works by Plath. Update: For those interested in obituaries that ran on Sylvia Plath, please see my paper "'They Had to Call and Call': The Search for Sylvia Plath" published in Plath Profiles 3 (Summer 2010). At the end of the paper (pages 114-115) I do discuss some obituary notices than ran in the Boston papers in the weeks after her death, and I include a scan of one of them. This is a post to advertise many of the new* book covers added recently to A celebration, this is. Sylvia Plath: Voice and Vision by Gayle Wurst (1999), Sylvia Plath's The Bell Jar edited by Harold Bloom (2009), The Plath Cabinet by Catherine Bowman (2009). The cover for Bowman's The Plath Cabinet reproduces some of the paper dresses held at the the Lilly Library, Indiana University at Bloomington. The paper dresses largely inspired Bowman's poetry collection. And, for my favorite, which can be found on the Prose books page: The Bell Jar (Braille edition - Cover) and The Bell Jar (Braille edition - Title Page, pictured left. You may have to angle your monitor differently or crane your neck a bit to see the text). 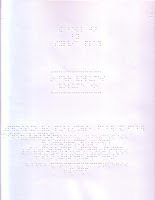 The Braille edition is a four volume, spiral bound set, printed by the Royal National Institute of Blind People, London, England. Of course Braille is named for Louis Braille, born on 4 January, 1809, or just over 200 years ago. The Plath books in translation (which includes biographies and works of criticism in foreign languages) is still on my list of pages to revamp; likely sometime later this winter or spring. I have many new book covers, sent to me through this amazing internet, from various persons, to which I say thank you! *New as in new to the site, not necessarily new to the world. Sylvia Plath's own artwork has received much attention in the last seven years. The Eye Rhymes exhibit at the Sylvia Plath 70th Year Symposium at Indiana University, Bloomington, in 2002, and the book Eye Rhymes: Sylvia Plath's Art of the Visual (edited by Kathleen Connors and Sally Bayley) published in 2007, led the way. And, artists inspired by Plath's work were given special exhibition at the Sylvia Plath 75th Year Symposium. Plath, who considered majoring in art at Smith College, had an emotional and creative reaction to artwork, in a wide range of mediums. Doris Kraler-Bergmann's recently published Sylvia Plath's Lyrical Responses to Works of Art: A Portrait of the Artist(s) (VDM Verlag, 2008) approaches Plath as a viewer of artistic works and as one who responds, lyrically, to them. This is called ekphrasis. Merriam Webster defines this as "a literary description of or commentary on a visual work of art." The focus of Kraler-Bergmann's book are the art poems Plath wrote in March 1958, at the request of ARTnews. Plath wrote two poems each on paintings by Giorgio de Chirico and Henri Rousseau, and four poems on etchings and paintings by Paul Klee. Though Plath wrote eight poems altogether, Kraler-Bergmann focuses on only two of them: "Yadwigha, on a Red Couch, Among Lilies" and "Snakecharmer". Kraler-Bergmamm also looks at "Sculptor". "Sculptor", written about and dedicated to Leonard Baskin, is not strictly an ARTnews poem, but it is ekphrastic. It was this March 1958, ekphrastic-creative outburst that lead Plath to believe she would be "the poetess of America" (Letters Home, 360). Obviously that came later and at a deep consequence, and unfortunately Plath failed to see any of these poems published in ARTnews. Kraler-Bergmann's study is a good read, and a welcome contribution to this subject, as well as an inspired examination of poems that Plath thought, for a time, were the foundation upon which her reputation would rest.